The team of our artists and editors is very fond of Mercedes-Benz cars. And that’s why we have already drawn a lot of different models of this famous company. But we mainly drew very expensive and elite models. 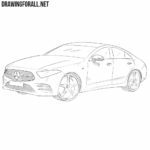 Today we decided to draw one of the most affordable models from Mercedes, and created a lesson about how to draw a Mercedes-Benz C Class. 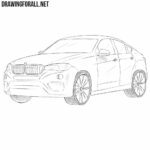 Like all previous drawing lessons, the lesson about the Mercedes-Benz C Class will begin with the main outlines of the body. Recall that the lines of this and the next steps should be very light, because in the next steps (to be more precise, starting from the third step), we will gradually erase these lines. In front of our Mercedes-Benz C Class we outline the grille and long headlights. 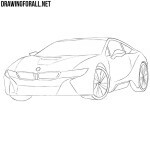 Next, we draw the outlines of the rear-view mirrors and the large wheels. Recall that starting from the next step we will use darker and clearer lines for final detail of our Mercedes-Benz C Class. 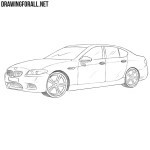 Using dark and smooth lines, carefully draw out the outline of the radiator grille and elongated headlights. Note that there are two types of radiator grilles at the Mysedes-Benz: either a large logo in the center of the radiator grille, or a small logo above the grille. Here we continue to work on the front end of our car. With the help of long and smooth lines draw out the outlines of the hood. Now go to the lower front part of the car and carefully draw out all the lines of the bumper and license plate. Do not forget to erase all unnecessary guidelines from the front of the car. Now we need to work with the top part of our car. Continuing the line of the hood carefully draw out the contours of the roof. Next, carefully draw out the windows and rear-view mirrors. Do not forget that the lines should be smooth and clear. Here we continue the lines of windows and carefully draw the doors, as shown in our example. Continuing the smooth line of the roof neatly draw out the back and the tail lamp. Next, draw handles on the doors and two longitudinal slightly curved lines on the side surface of the body. This step is probably the most difficult in this lesson. With the help of smooth lines here we need to draw out the wheels and wheel arches. These details should be as round and smooth as possible. In the same step we need to erase all unnecessary guidelines from the body of our Mercedes-Benz C Class. Now let’s get to the rims. First draw a small circle in the center of the rims and then draw the lines going from the center to the edges. 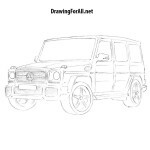 But do not forget that you can draw rims either as it is shown in this example, or in our other lessons (for example, about Mercedes-Benz GLS) or to come up with your own design of wheel rims. If you drew the body and wheels of your car, then start drawing the shadows. First of all draw some glare on the body and glasses of our Mercedes-Benz. Next, using dense hatching, draw shadows in the areas shown in our example. If you did everything right, now you know how to draw a Mercedes-Benz C Class. Despite the fact that our site already has a lot of different lessons about different Mercedes-Benz models, we will still continue to create new lessons about these cars. Support us by subscribing to us on social networks and sharing our drawing lessons with your friends (or on your site if you have a website).